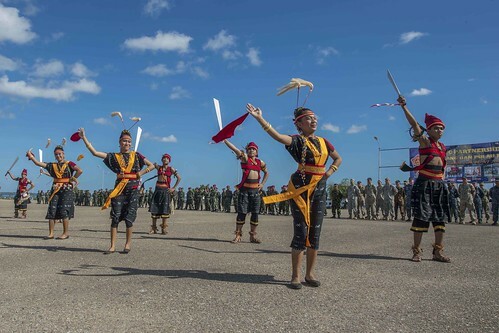 KUPANG, Indonesia - Service members from Singapore, New Zealand, Indonesia and the United States along with members of the humanitarian community attended an opening ceremony here hosted by the Indonesian Armed Forces (TNI) to officially commence Pacific Partnership 2014, May 26. In its ninth iteration, Pacific Partnership is the largest annual multilateral humanitarian assistance and disaster relief preparedness mission conducted in the Indo-Asia-Pacific. Country participants include representatives from Singapore, New Zealand, Indonesia, the United States, Timor Leste, Cambodia, Japan, Australia, and Philippines. The ceremony began with representatives to include the U.S. and New Zealand arriving to the music of the TNI 7th Primary Naval Base band. The joint forces marched on the parade grounds together, followed by an official review of troops by TNI Surgeon General Maj. Gen. Daniel Tjen. "It was a great experience marching with the different military participants," said Chief Hospital Corpsman Fredrico Calaguas, a San Diego native assigned to Naval Hospital Camp Pendleton. "It is interesting how differently they march, salute and call commands here, but at the same time, our salutes, marching and commands are different to them." The New Zealanders had a similar experience. "It was a blast being able to march with all the participants' side-by-side," said Christina Perro, a dental assistant and Kohukohu, New Zealand, native. Capt. Rodney M. Moore, commodore of the 30th Naval Construction Regiment and mission commander for the Indonesia and Timor-Leste phases of Pacific Partnership, and Tjen delivered remarks, officially commencing Pacific Partnership 2014. "We are all building strong bonds that will endure time and improve our ability to work together in times of need," said Moore. "Multilateral missions like Pacific Partnership are based on common goals, goals that provide a unique benefit to the security of participating nations by increasing regional stability." Tjen and Moore then signed a stone, symbolizing peace and cooperation among forces. Plans for the stone are that at each engineering site it will be replicated and represent where partner nations and the humanitarian community worked together to complete projects. "I am so proud to be participating in this joint partnership between nations," said TNI Capt. Tony Tatangung, an operations officer for the Indonesian navy. "This exercise will allow us to increase our capabilities and enrich our resources should a disaster arise." 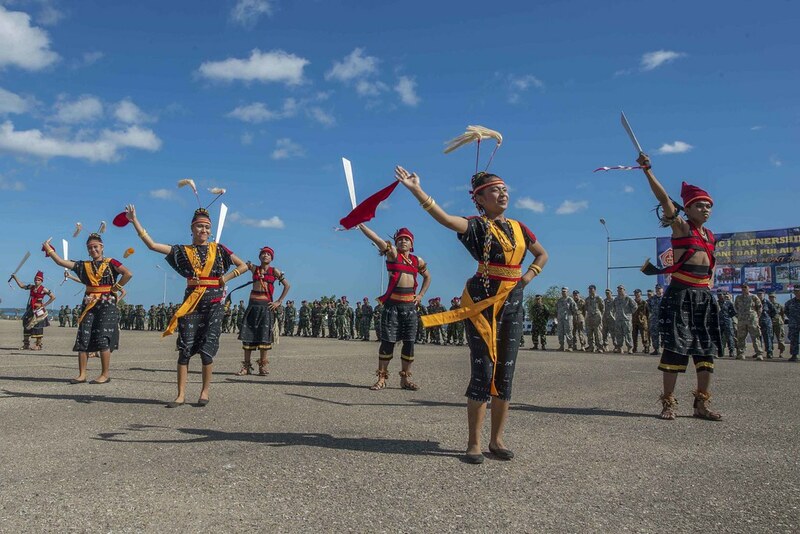 The ceremony wrapped up with service members from all participating nations joining together in traditional dances from the island of Nusa Tenggara Timur, followed by a reception and press conference. "The best part of the ceremony was definitely the dancing," said U.S. Army Capt. Mario Ponsell, a Warner-Robbins, Ga., native and civil affairs team leader assigned to the 85th Civil Affairs Brigade. "I thought it was a great way to integrate each nation represented here together to enjoy a good bit of fun and learn about Indonesian culture," said Ponsell. This year, Pacific Partnership features simultaneous seaborne and airborne phases with the airborne phase focused on the nations of Indonesia and Timor-Leste, both located on Nusa Tenggara Timur. Medical and engineering personnel will conduct numerous medical, dental and veterinary engagements, along with engineering civil action projects. The seaborne phase is a Japanese-led mission and is scheduled to visit Vietnam, Cambodia and the Philippines.